Attempting to trim your dog's nails using a dog nail clipper can seem like a difficult process, particularly when dogs express their disinterest in this procedure through extreme measures. The key to effective dog claw care is good technique and use of best dog nail clippers as the right tool. In this pet clipper review, you'll get a good glimpse of both. The way you clip your dog's nails, the type of dog nail clipper you use for your canine's paw nail care and how you handle your pet in the process will determine how successful your dog nail trimming session is going to be. For this review, while we were testing the many different pet clippers, we've considered all crucial aspects of the whole pet grooming process and managed to specifically test some of the all-time best nail clippers for dogs, provide a thorough review of each product, and pick ten best dog nail clippers as per those factors. We know that dogs are known to be sensitive to nail trimming, thereby the right technique and proper dog grooming supplies are essential, and we'll address that under each product's review. Note that there are two different ways to trim your dog's nails – using mechanical and electric nail trimmer, and these methods both differ significantly. If you need help in understanding of how to properly clip and trim your pet's nails using either of these tools, read our guide on clipping and also on using the Dremel. In the above linked guides, you'll see how to not cut dog's nail too short, how to use these dog grooming clippers for nail trimming and everything else you need to know about dog nail clipping. Our editor Samantha has made several videos for you using these best dog nail clippers properly and efficiently. This will also help you better understand which type of nail clippers is right for you and your pooch. Right after you purchase any one of these best dog nail clippers, make sure to learn how to use them correctly to avoid injuring yourself or your dog, and avoid dog nail bleeding. If you follow all the instructions in our videos on how to clip dog nails, you'll learn the process in no time. Using a dog nail trimmer or dog nail clipper from the below list will make the job easier, too. Please note that this first pick on our list of best dog nail clippers wouldn't necessarily be objectively the best option or go-to pet nail trimming tool for every pet owner. This is the Dremel nail grinder, and it is not an ordinary piece of equipment for trimming dog's nails. First of all, this is an electronic pet grooming kit with a rotary tip: you can cut, trim and shape your dog's (or cat's) nails using this pet nail trimmer. Dremel nail grinder is safe, effective and very easy to use. There's no need to push hard on this pet trimmer and you shouldn't be afraid of breaking either the nail or the tool, either. It works more like a dog nail file that's good for nail trimming. If you read or watch the full Dremel tool review, you can see that this dog nail grinder works very well when it comes to trimming or cutting dog's nails. However, it may not be the first pick among the best dog nail clippers for some owners and we explain why in the review. The price of Dremel pet nail grinder for dogs is slightly more expensive than the traditional, metal or plastic, plier- or scissor-like pet nail clippers for dogs, such as those other nine options picked for our best dog nail clippers list. Dremel tool is battery powered, so there's no cord. This pet nail trimmer is compatible with an array of other Dremel sanding drums and bands, which means you can use it for other tasks if that's something you're interested in. You get a 2-year warranty with these electric dog clippers. Dremel 7300-PT 4.8-Volt Pet Grooming Kit may be considered as one of the best dog nail clippers mostly because of how easy it is to use it. However, some dog owners may prefer the traditional style of nail clippers for dogs, in which case, our next pick at number #2 would be your best bet. Safari dog nail clippers are personally my favorite ones, and our editor Samantha has also picked them as one of her top choices for the best pet nail clippers for dogs awards. Safari has been making dog grooming supplies for a while now and they're quite good at it. This is a very simple, traditional style dog nail clipper designed specifically for the ease of use and simplicity, yet they are often considered as professional dog clippers for trimming nails. If you decide to go with a set of traditional best dog nail clippers, then Safari is your best bet since it's very easy to learn how to cut dog's nails using this dog nail clipper. The reason most pet owners prefer Safari dog nail clipper is its low price (especially when compared to less popular dog nail trimmers that are somehow also more expensive), and the fact that you can pick Safari's dog nail clipper for large dogs or medium dogs. Additionally, these Safari dog toenail clippers are very sharp and somehow do not go dull as fast as many other pet nail clippers. I guess that's the reason why these are one of the most popular best selling dog nail clippers on Amazon. In the third place of our best dog nail clippers list is another dog nail clipper that can be considered just as good as Safari's dog grooming clippers in the second place. It's the very popular and well-reviewed professional dog nail clippers from Epica. Let's begin by saying that the only reason Epica's dog nail clipper gets a third place and is behind Safari is the price. These two best dog nail clippers are extremely similar, but Epica's pet nail clipper costs about $1 more. Epica has made a great set of grooming clippers which does an excellent job of your dog's nails. This dog nail clipper is very easy to work with, and the handle is comfortable to hold. Their design works best for dogs of medium to large size, and not suitable for small dogs. These dog toenail clippers are sharp enough to cut through anything, so just be careful when working with Epica. These third best dog nail clippers are also very popular and have been one of the best selling pet clippers on Amazon for over a year now with a huge range of positive reviews from other pet parents and groomers. The company also offers 100% money-back guarantee, which means if you don't like them, simply return for a full refund. One may say that this set of fourth best nail clippers for dogs is coming close to being of professional quality, but the truth is, Epica's and Safari's (even the Dremel dog nail grinder) are just as good at cutting dogs nails, even though they are not marketed as professional dog nail clippers. The company claims that these dog toenail clippers have been designed by veterinarians themselves, so that's something to consider. Listed at the fifth position on our best dog nail clippers ranking is a product from the famous company, Andis. They are very well-known for making one of the best dog hair clippers, and have fairly recently got into the dog nail clipper category as well. Once again, when it comes to picking among traditionally designed pet nail clippers, majority of the “good” options are extremely similar, since the design itself is pretty basic. Therefore, all top five options of these best dog nail clippers are actually almost identical, and it all comes down to price and personal preference. As you can see in the video review, Andis dog nail clipper will get the job done without any problems and the process of trimming dogs nails is exactly the same as with any other grooming tool (besides Dremel pet nail trimmer, of course). But once again, it seems this dog nail clipper will be best suited for medium sized dogs and large dogs. I would be cautious about using this dog toenail clipper on small dogs. This dog nail clipper is placed in the sixth position over professional dog nail clippers from SimplyPets (listed below) because they are very close in quality yet cheaper. GoPets' dog nail clipper has also been a hot Best Seller on Amazon for months now. It appears that majority of dog owners love this pair of clippers for dogs and continue to pick them even over cheaper options such as Safari or Epica. If you're lucky, you might even get a chance to jump on some promotional discount, which GoPets does very often with their products, including their nail clippers for pets. Quality of GoPets dog nail trimmer is said to be professional and veterinarian recommend (but remember, grain of salt and all for these recommendations). I also feel it's important to mention that whenever you purchase a dog nail clipper from GoPets, the company donates 10% of proceeds to animal welfare charities. We're coming closer to some of the last choices of best dog nail clippers for your beloved pets. In the seventh place we've got another set of truly professional dog clippers from Trim-Pet that have been designed based on customers' suggestions. Once again, just to avoid repeating myself over and over again, the design of these dog nail clippers is very similar to most traditional scissor-style type of pet toenail clippers. These are marketed as professional dog nail clippers, and they seem to have used some better quality materials; however, it doesn't look like it made any positive impact, since the cheaper options still feel better in your hands. Therefore, it's very important to note that this dog nail clipper is so far the most expensive ones on this list, and the number of reviews is also not that large compared to, say, Safari's or Epica's clippers. If you're very interested in testing this dog nail clipper, my suggestion is to visit manufacturer's website where they give you a lot of tips and reasons why these are possibly the best ones out there, and then decide whether it's worth an extra $5-15. The company provides a lot of helpful information when it comes to tutorials about trimming puppies nails and such. Here's a truly tough dog nail clipper from Millers Forge. It's also the cheapest dog nail clippers on this list. They are essentially the same thing as many other best dog nail clippers above, but their design is much more simplistic and less ergonomic. Millers Forge doesn't seem to care about the design as much as they do about the effectiveness of this dog nail clipper. 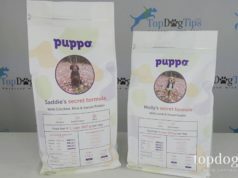 It translates into the product, which is great for large dogs and even huge breeds. However, the handle is not very comfortable and your hand may get tired pretty quick when using these dog toenail clippers. This is definitely a set of sturdy grooming clippers, and many other dog owners mentioned in their reviews the same thing about these eight best dog nail clippers from Millers Forge: they're sturdy, durable but the handle isn't the most ergonomic. These are somewhat basic and reasonably priced, considering that they will last you a long time even if you try to break them. At the ninth position is yet another dog nail clipper from the same company, Millers Forge. This, however, is a much different set of best dog nail clippers due to their design – nothing we've listed here before. It's a pliers type of dog nail clipper, meaning it works the other way around than scissor-like clippers. These pet nail clippers are extremely basic and cheap. If you're looking to save as much money as possible on your purchase of grooming tools, then these Millers Forge pet nail clippers is your best bet. At around $6, you will not find anything cheaper or more reliable. Many other pet owners don't seem to complain and have rated this product fairly positively. The plier-style dog toenail clippers are definitely long-lasting if used with small dogs, but their handle – just like its big brother above – isn't comfortable enough to deal with when cutting nails even of medium sized dogs. Also, these aren't recommended for large dogs since they won't be able to cut through strong nails. Finally, the last choice on our best dog nail clippers list here is a decent product from Happy Dogz. I found a lot of great response about this set of pet clippers for dogs from many pet parents online and I figured we'll have to include them as well. Many dog owners seem to recommend this dog nail clipper from Happy Dogz as their favorite choice after trying other options; however, there are quite a few negative or semi-negative reviews on their Amazon page. I recommend you browse it before choosing this set. Happy Dogz dog nail clipper's price isn't that much more expensive than a few others mentioned on this list. The main thing about these clippers is that they look great and actually have a very ergonomic handle. I like their general concept, style and design, too. Manufactured by a professional dog groomer (not a veterinarian), it feels like the Happy Dogz team behind this dog nail clipper creation knew exactly what they were doing. You also get 10 years money-back no questions asked warranty. 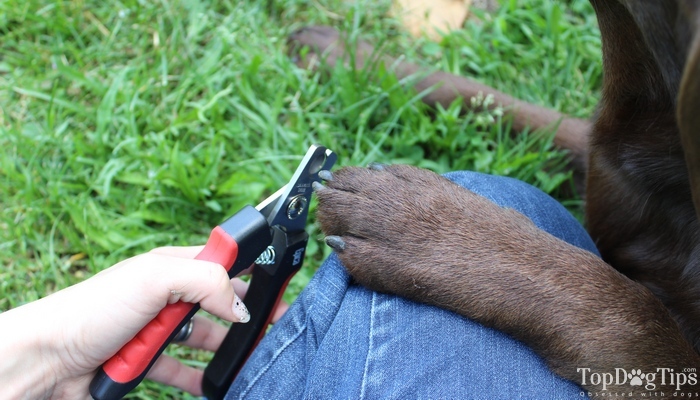 And this rounds up our list of ten best dog nail clippers. If you have any recommendations of your own for the best dog nail clipper, then let us know in the comments below. In the meantime, please take a look at the videos of how to trim dogs' nails safely and other tips on grooming dogs and cutting dog nails properly. Not every pet owner may feel confident with cutting dogs nails, and that's okay. At first, it seems like a complicated process during which you may hurt yourself or your dog. While this is certainly possible, cutting your dog's nail too short, too far, clipping the quick or making him bleed is not that easy to do. However, if you need help with using a dog nail clipper, trimming dog's nails and you want to learn how to clip dog's nails properly and safely, here's a full step by step video instructions that will walk thought the whole process. In this video, Samantha also used one of these best dog nail clippers mentioned above. How to Use These Best Dog Nail Clippers? When you first set out to groom your dog and cut his nails, it's important to use the right dog nail clipper and then follow the techniques, tips and tricks that professional dog groomers and veterinarians use in their grooming practice. Don't rush the process and be considerate of your canine. As many dog experts in their dog books indicate, the most accurate answer to how should you use any of these best dog nail clippers would be: it depends. If your pooch walks and runs around a lot outside, especially on concrete and similar surface, then nails will be getting trimmed a little bit all the time. If he/she lies around the house a lot, then as a general rule, once a month would be a good start to put those best dog nail clippers to good use. The more often you do this, the quicker you will figure out your canine's nail growth speed patterns, and you'll soon know when exactly to trim them. Vet Med talks more about dog claws and their trimming here. Normally, your pet's nails should not reach the ground when the dog is standing still. To make your dog associate nail trimming process with something good, you would need to reward him/her with some of the best dog treats or best dog food choices (whichever your canine prefers). Remember to praise your dog and pet them after a successful grooming process – they need to know that they did good. At first, it would be difficult to reward after the whole process, so start with small healthy treats after each nail clipping. One nail = one treat. That way your dog will start looking forward to the process. Your Fido will not be looking forward to this procedure, so don't expect to use your best dog nail clippers right away to give your pet a full pedicure. Make it a gradual process, and take it slowly. Don't rush. Approach your pet in a calm, playful manner; talk quietly and don't make this into a sudden-movement competition. If your dog flinches, do not react in a same way but rather attempt to calm them dog. Use treats. Having great tools when dealing with stressful pet grooming situations like bathing a dog or clipping dog's nails will make it less uncomfortable for everybody. The above compiled list of best dog nail clippers for your dog's nail care will help you make the right choice for the most appropriate dog grooming tool and have a stress-free pet grooming session. 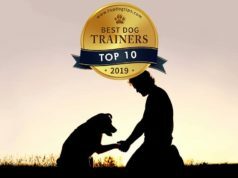 I recommend you more details about every one of those product on their official page, watch our video and written reviews of dog grooming tools, and read other pet owners' customer reviews on product's Amazon pages. It's possible someone will have the same dog breed as yours and have already tried either one of these best dog nail clippers, and reviewed them to a great extent. There's always something to be learned from other dog owners who have already purchased an item you are trying to research. Previous articleDisaster Preparedness: Are You and Your Pet Prepared? Came onto this page to see how others cut dogs nails, had to endure 10 minutes of utter crap to get to the point ffs!! Kept having to jump forward on the video & by the time i found the actual cutting of the dogs nail (3/4 of the way through) i turned off as i’d had enough.